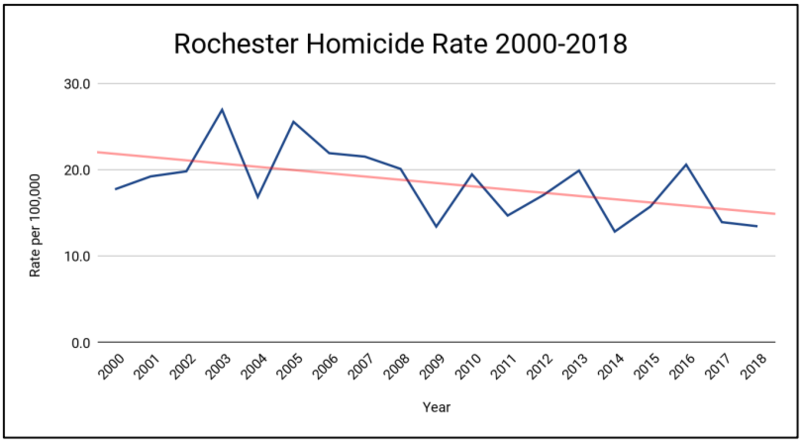 If you look at a graph of the number of homicides in Rochester in the last decade, it looks like a roller coaster: 42 in 2008, 28 in 2009, and 41 in 2010. It kept going up and down until two years ago, when for the first time in more than two decades, the city’s homicide rate stayed below 30 in consecutive years. That’s nearly half the 20 year high in 2003. The data is from a recent study from Irshad Altheimer, who is the director the Center for Public Safety Initiatives at Rochester Institute of Technology. He says Rochester’s decline isn’t universal. So what’s causing Rochester’s decline? Mayor Lovely Warren credits increased community engagement and programs like Pathways to Peace and says one factor is the Rochester Police Department’s focus on efficiency. “In my estimation, is that we did something different by letting the data drive our decision making and that data has helped us make better decisions on behalf of our citizens, but also give our citizens a better view of what our police department does on a daily basis,” said Warren. Altheimer agrees that Rochester’s crime prevention efforts and better trauma care could play roles in the dropping rate. So far this year, there have been five homicides in the City of Rochester.